Single-chamber solid oxide fuel cell (SC-SOFC) stacks with different angles between the gas flow direction and the electrode were fabricated and tested in a diluted methane-oxygen mixture. The gas tubes with separated gas vents were used for transmission of the reactant gasses. 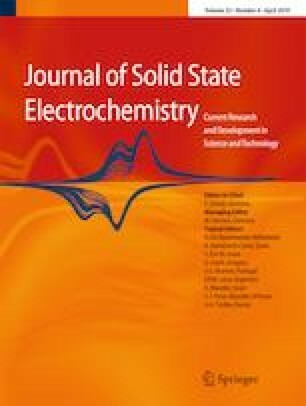 Experimental results showed that the performance of the two-cell stack at a gas flow angle (θ) of 45° was greatly enhanced compared with that at 0 and 90°. At a furnace temperature of 700 °C and a CH4/O2 ratio of 2, the maximum output power of the anode-first configuration was 154 mW at θ = 45°, which was 51% higher than that obtained at θ = 90°. Additionally, the maximum power of the anode-first stack was higher than that of the cathode-first one at θ = 45°, which was contrary to the results obtained at θ = 90°. The stack with an angled configuration of θ = 45° will generate a more attractive power for portable power applications. This work was supported by the National Natural Science Foundation of China (Nos. 51602213, 11604236 and 61575139) and the Youth Foundation of the Taiyuan University of Technology (No. 2015QN071).